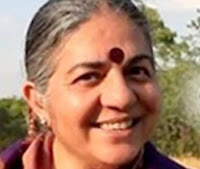 Close on the heels of a top Netherlands report giving a clean chit to the controversial American multinational corporation (MNC) Monsanto, saying the Bt cotton farms using its genetically modified (GM) seeds have negligible child labour compared to those using seeds from Indian companies, one of India's topmost environmentalists Vandana Shiva has sung a totally different tone. Shiva points out, “India’s laws do not permit patents on seeds and in agriculture. But that hasn’t stopped Monsanto from collecting close to USD 900 million from small farmers in India, pushing them into crushing debt. This is roughly the same amount of money Monsanto spent buying The Climate Corporation — a weather big data company — in a bid to control climate data access in the future."